Barack Obama on Facebook, without crediting him, so that my really conservative friends can unknowingly "like" something the President said. I posted something similar last Easter. 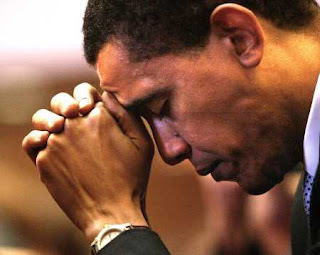 I don't usually quote presidents, especially not on spiritual matters, but I am fascinated with the spirituality of President Obama. More specifically, I am fascinated with the popular criticism of his spirituality. Quotes like the one above are all over the place. He has never been apologetic about his Christian identity. And while you could nit-pick inconsistencies and points of disagreement, as you could with anyone else, if it were anyone else--indeed if it were a Republican President--I am confident that criticism would be far less popular. I don't remember, at any point of his presidency, George W. Bush having to be so articulate about his faith in Christ. It seemed that for him it was enough just to claim it... no explanation was necessary. And With President Obama, the opposite seems to be the case. He has claimed it and explained it and it is still very popular for the media and for bloggers to question his commitment to the Christian faith. Now don't get me wrong. I am skeptical about the sincerity of any politician... especially the President (anyone who's been so successful in such a corrupt system should be under scrutiny)... and especially when it comes to Christian faith. I am of the persuasion that the Christian faith is, by and large, a faith for the disenfranchised, the poor, those on the under-side of society... indeed it's about solidarity with a crucified man, making the claim that such a person is not only the true king but is indeed the God of all creation. Christianity's roots are in the bodies of ex-slaves who illegally emigrated from Egypt. It's theological heritage includes the convictions of an ex-murderer and some poor fishermen. It's clearest expressions were performed by prostitutes and tax collectors. The Christian faith, as it seems, is inherently in opposition to coercion and power, as such. Of course, however, everyone is invited to join God in God's preferential love for the needy. But any person who claims Christ and carries a position which thrives on power and even exploitation should be regarded either as a contradiction in terms or as a paradox. I firmly believe that God loves a good paradox, so there's no real problem in my mind with a President being a Christian, as long as the substance of their faith compels them to wield their power in love on behalf of the "least of these." But of course I'm gonna scrutinize the president's theology and sincerity, not because I want to judge him but because I'm invested in healthy theological dialogue and the construction of shared ecclesiological values. But why the skepticism from the media? Why from so many who wouldn't otherwise question someone's faith if they're open to claim it? If anyone on the street gave equally robust explanations of the content of their convictions, few would hesitate to accept them as a Christian. So why? We should spend less time judging and scrutinizing whether or not the President actually believes what he says and spend a lot more time embodying the sort of change we'd like to see. In the end, does it matter if the President of the United States is a Christian? Would it not be equally "American" for us to have a Mormon, Jewish, or even a Muslim President? Some, I'm sure, would site references to argue that America is a "Christian nation" or that it should be. But I'm not sure those terms can go together in any real or functional way as long as the Kingdom of God includes every nation. And I'm not sure it's very "American" to presuppose that the President should be a Christian. Ironically, the debate concerning the faith of the President seems to preclude anyone of any other faith from being the President of a nation that wants to celebrate "freedom" with such enthusiasm. Perhaps it's mutually disadvantageous for us to demand the President to claim Christ. But for now, I am confident that the man who holds office today is as much a Christian as I am. Indeed, there are no degrees to such a distinction.